Buddha Jayanti is celebrated to commemorate the Buddha’s birth, enlightenment, and leaving of his mortal body. It thus is a commemoration of the Buddha’s whole life that spanned a period of 80 years. For the devotees who wait one year long for this thrice blessed day, the one-day celebration does not seem enough. Relieved! This year, though the gazetted holiday on Buddha Jayanti is 30 April, the festival spreads over 29-30 due to the stretch of the full moon over these two days. Known also as Buddha Purnima, Vesak, Hari Wesak, Wesak, and Wisakha Bucha, this festival generally falls on the full moon day of Vaishakh or Bohag (in Assamese), the first month of the Indian calendar. It is the most important day for the Buddhists across the world. Like the previous years, this year also the Buddhist fraternity of Assam is celebrating this hallowed festival with great vivacity, gaiety, and religious fervour on the first or second or both days according to their convenience. Thus International Brotherhood Mission (Regional Centre of the World Fellowship of Buddhists, WBSC, BLIA), Dibrugarh has scheduled the programmes of the ceremony on April 29, while Margherita Buddha Vihar, Margherita divides the programmes between two days, and again Pandu Buddha Vihar, Guwahati arranges the event on April 30. However, variation in the day of celebration does not make any difference in the core rituals with which the celebration starts at the vihars. For these rituals are the festive manifestations of the teachings of the Buddha. 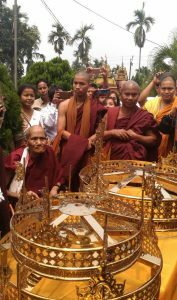 Generally, these rituals include chanting by the venerable monks for peace, hoisting the flag, Buddha puja, dhamma discourse by the monks, offering to the Venerable Sangha, offering foods to the devotees, and lighting candles etc. All these dhamma chores create a calm atmosphere. Thus amidst the serenity of these sacred rites, holy chants, good vibes, and the wholesome practices, the devotees make a retreat from their hectic work-filled life. Empathy is the highly-valued virtue in Buddhism. In some countries like Singapore, people release caged-birds that show their empathy for other animals. In Assam, this ritual (of setting free of the caged-animals) is not observed. But empathy is practiced differently. For instance, International Brotherhood Mission distributed milk and biscuits to the ailing people. Again, to enlighten the mass with the relevance of Buddhist teaching to society, the organization has organized a seminar on Buddhist Perspective of Peace and Harmony. This thrice blessed day has seen Margherita Buddha Vihar in all its fulfilment and bliss. It has been a long-cherished wish of Bhikkhu Gyanawada— the chief monk of the vihar— to build a pagoda in his vihar campus. 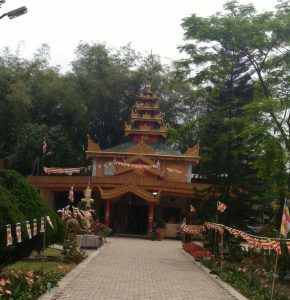 To his happiness and relief, the pagoda got ready to be inaugurated on this sacred day. It has been inaugurated by Venerable U Gunawantha Mahathero (99), the oldest Buddhist monk of Northeast India. Pagoda is a tomb-like structure where sacred relics of the Buddha are kept and venerated. Hence installation of crown and dhatu (mortal remains) has been another important event of the day. To keep a record of this grand event, the temple management committee has published a souvenir named Dhammapabha which is released in presence of the monks, devotees, guests, and the academics like Rana Sangmai, Jagat Sangmai and this author herself, who is a researcher on the Tai Buddhist communities of Assam. Edited by Dr Bhikkhu Bodhipala, the souvenir is a good collection of thoughtful articles on Buddhism in general and the Buddhist practice of Assam in particular. The unique feature of Buddha Jayanti in Assam is that this festival is not confined to the Buddhists only. 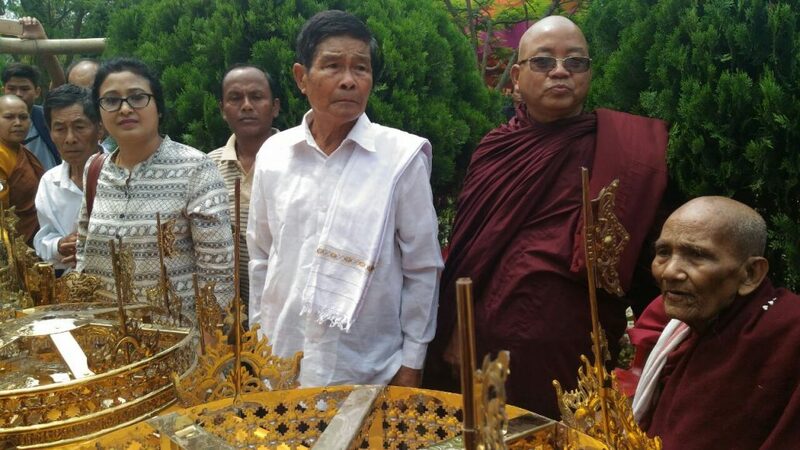 The ceremony has a genuine acceptance among the non-Buddhists as well. For the Hindus, particularly, it is a hallowed day on which the householders organise auspicious ceremonies to procure the blessedness of this sacred day. Again, when it comes to the celebration in monasteries or vihars, it is not a wonder to see the non-Buddhists praying before the shrine with their Buddhist fellows. Mingled in one body in a perfect union.